Welcome to another Then and Now post, a continuation of my series where I revisit some older blogposts and either rip them to shreds (because my thinking has changed on such subjects) or I’ll confirm my position on various personal finance topics or specific investments. Today’s post is about a Canadian dividend paying stud I’ve owned for many years now: CIBC (CM). I started writing about this stock some eight years ago. Hard to believe I’ve been running this blog that long! I figured CIBC (CM) was a cash machine back then. I should probably own it then. In 2009, I was transitioning out of big bank mutual funds and I started looking at various Canadian dividend paying stocks to buy and hold. CIBC was one of them. 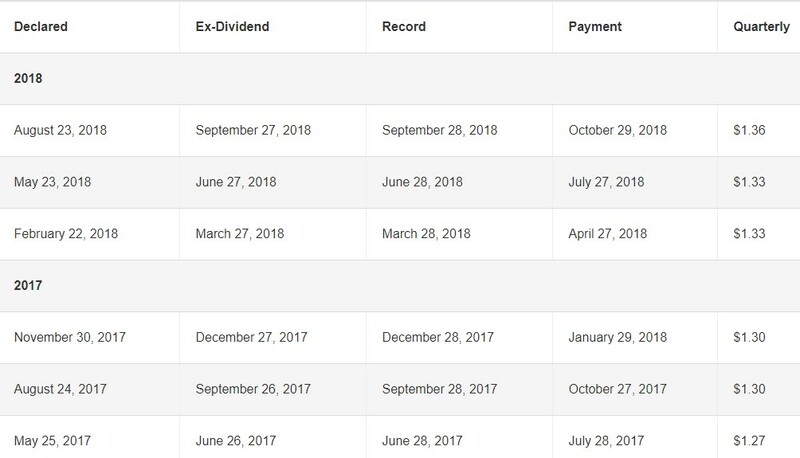 I found the dividend history of CIBC like other big bank stocks, very appealing. I still do! When I started my DRIP with CIBC I remember buying shares at $65. My first quarterly dividend from CIBC was $0.87 per share. In 2011 I stopped by full DRIP with CIBC and transferred my shares to my discount brokerage – my “how to” process you can read about here. At the time of this post, CIBC stock is now worth close to $115 per share. At the time of this post, CIBC pays a quarterly dividend of $1.36 per share. 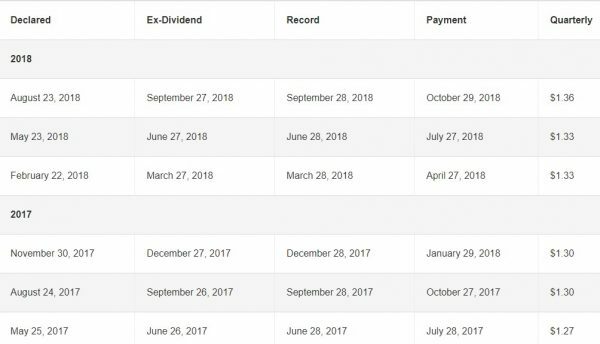 We’re fortunate to earn enough dividend income, just from CIBC stock in one year, to cover our entire hydro bill expenses (if we wanted it to) and never spend the capital. We of course, do not spend our dividends now. We reinvest all dividends paid to buy more CIBC shares every quarter. We’ve learned money that makes money, will make more money over time if we don’t get in the way. Image courtesy of CIBC dividends page. Will we hold CIBC long-term? Hard to tell but I can say I’m optimistic that our collective basket of Canadian and U.S. stocks, along with some low-cost ETFs, will continue to grow over time as long as we stick to our plan. You can read more about our income-generating approach using dividend stocks here. 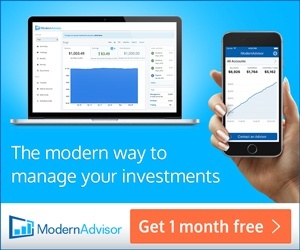 You can read about our wealth-building approach using low-cost ETFs here. Thanks for reading and stay tuned for another Then and Now post in the weeks and months to come. 28 Responses to "Then and Now – CIBC"
You are doing very well with your Canadian banks. Congratulations. Canadian Banks are under lots of pressure recently. I guess this has things to do with the house market going down and the very high debt Canadian people are in. Nevertheless, I have kept buying Canadian Banks for past year and many of them are underwater now. Today I added another 100 shares of TD. Financials is now 23% of my portfolio. Maybe I was making wrong decisions all the way. Only time will tell. It’s coming along May. Certainly not at our goals yet but we have 4-5 years to realize some big ones – re: portfolio goal and no debt. I don’t mind CDN banks beating beaten up – better than way for me as a long-term buyer and holder. I suspect the same for you. Yes, time will always tell eh? Yes, owning Canadian banks over time has been nothing but great. Mark and others are in great shape. I agree May about being under pressure. Maybe it will contine or worsen or maybe not. Long term not concerned. I’ve bought small amounts of banks myself over the past year but which hasn’t to date been positive, but give it time. You’ll do well, especially if you’re dripping and with growing dividends. Not sure if my bids will get hit but I have orders in for TD, RY, CM, BNS right now and watching BMO. No rush for me. I don’t know if you mean 23% of total portfolio or of equities. This question of financial percentage made me curious. Good exercise. It took me a few minutes to calculate with stocks and 2 US, 2 Int ETFs but my number for financials is 12.9% of total portfolio, 21.5% of total equities. CDN financials = approx 40% of financial equities currently. Mark, I own your list but not TA. J&J is through VYM ( J&J biggest holding), VTI (J&J 5th biggest holding). 23% of my total portfolio. Among the big Canadian banks I am a little bit low on TD and that’s why 100 shared today. But I probably will stop to add any more for a while. I am aiming for long term and I doubt something like US banks during 2008-2009 would happen to Canadian banks. But who knows. Hopefully long term it turns out OK. I think I really should be more patient. That’s some big weighting when you have fixed income too- double me! I doubt it very much too. The basel 3 regs, forget whatever they call it now but higher tier required secured funds are much higher now, and lending is much more strict. I continue to own every stock in that post though. All of them are DRIPping >1 share per quarter. I wanted to buy NTR, MG, QSR, RBA and BPY.UN. Probably will pull the trigger on BPY.UN very soon, and the other ones are on my watch list. BPY.UN has been paying a good yield for some time now. Ditto with the banks. Decent chance they’ll be around for the time I want to invest in them. Who knows? I don’t mind if they drop and don’t rise for a while. Of the list I only drip some of my ENB and all FTS. Others pay daddy to live! Got it on the TA. CM is one of our investments that we acquired back when we had an FA. I’d have to go back in the records to see when but IIRC it was shortly after the 2008 debacle. I sold 300 in the fall of 2017 when I went a bit defensive and then had sellers remorse in the spring of 2018 and bought 120 back (along with some more BCE and BAM.A) when Temple paid out their debenture and I had a bunch of cash laying around. Currently DRIPping 5 per quarter. I don’t see any reason to make any changes for now and suspect we will be holding these when we die. Nice. After I stopped my full DRIP with CM I basically let the stock continue to synthetically DRIP in my brokerage account. My DRIPping 3 shares per quarter and no intention of stopping that. My biggest holdings (I will write about that at some point) are VYM and BMO. >5% of the portfolio is in VYM. Hope to eventually have >20% of portfolio in that. 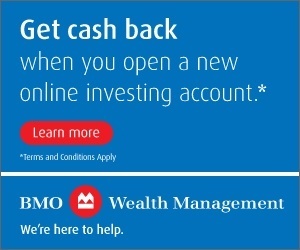 BMO is approaching 5%. I try to keep all individual stocks <5% of portfolio. CM is about 3.8% I recall. If all the CDN banks go under, at the same time, our country is doomed. It’s announce that TFSA contribution limit for 2019 will be $6000. Good news for this part. Inflation rate is much higher though from this site. 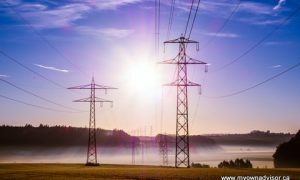 More pressure on investment return keeps up with inflation. Yeah, I saw that from another site. Good news for many folks. So, I need $12K to invest in 6 weeks. As long as we continue to pay down our mortgage and make our condo saving obligations I think it’s the right call for us. Now….what to buy….maybe British ADRs this year!? I have enough CDN banks. I own enough ENB. Utilities are always an option. Might be a good way to easily diversify out of N/A. Will Brexit conclusion??? give a lift there? I’d have to find a good source to find a list/research. From memory I think Royal Dutch Shell, Glaxo Kline, BP, Astrazenaca, HSBC, unilever, Br tobacco etc might be some suspects! Exactly. Post coming up on that…re: British ADRs! Will look forward to it. Pretty sure I own all now through 2 etfs, if I was to check. Bought some TD & CM today. Another down day and more may hit. Buying machine. Lucky you. Need to save for that 2019 TFSA here 🙂 6 more weeks! LOL, have 5 more orders in now and watching others. Some is for our TFSA’s (in kind). I just read in the Globe (David Rosenberg-Gluskin Sheff) the TSX forward P/E ratios are cheaper now than 95% of the time. Who knows if this truly means something but it “seems” to me to be worthy considering. Oh very much so. CDN banks are collectively rather cheap right now. Good timing. I bought TD one day too early. May, we both picked it up at what seems to be decent prices. Who knows in the short term. Agree Mark that banks offer better value now, but are they lower for good reason? Dunno. Taking my chances and building my unregistered a little for more income. We own some CIBC shares thanks to my wife’s employee share purchase plan. She no longer works at the bank but we’re holding onto the stock because it has a fairly low adjusted cost base thanks to steady purchases during the 2008-2010 crash. It’s not a large part of our portfolio, so I don’t mind hanging onto them, plus the quarterly dividends are great 😉 We may end up using them for donations rather than trigger the capital gains (Although I’ve never done that before and have no idea how complex that process is).